The 66fit Ab Roller is a proven tool to tone your abs, back arms and shoulders all at the same time. Get the abs you have always wanted – this tool will even tone those muscles in the lower abs which are tough to train in most exercises. 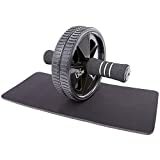 It features a two way easy-glide wheels and foam padded molded handles for easy grip which provides an affective workout. You will also receive a knee pad for added comfort. This entry was posted in Fitness Products and tagged 66fit, Abdominal, Core, Exerciser, Fitness, Knee, Roller, Wheel, Workout by Summer 365. Bookmark the permalink.